Authors: M. Cadelano et al. A large fraction of all stars are believed to exist in binary systems. Many of these systems contain more exotic objects than conventional stars. One particularly interesting class of objects are millisecond pulsars (MSPs), which are rapidly rotating neutron stars with rotational periods on the order of 1-10 milliseconds. These objects are found in binary star systems, and are believed to have been spun up to their high rotational velocities by accreting matter from a companion star. As a result, the companion star is often a helium white dwarf (WD) stripped of its overlying layer of material. A significant fraction of MSPs are found in globular clusters, and it is believed that these clusters encourage the formation of binary systems because of their high density of stars. Fig. 1: Hubble Space Telescope images of the pulsars observed in this paper. The black circles are centered around the pulsars, while the red circles indicate the positions of their respective white dwarf companions. The authors in this paper use ultra-deep UV observations from the Hubble Space Telescope to to search for optical companions to binary millisecond pulsars in the globular cluster 47 Tucanae. 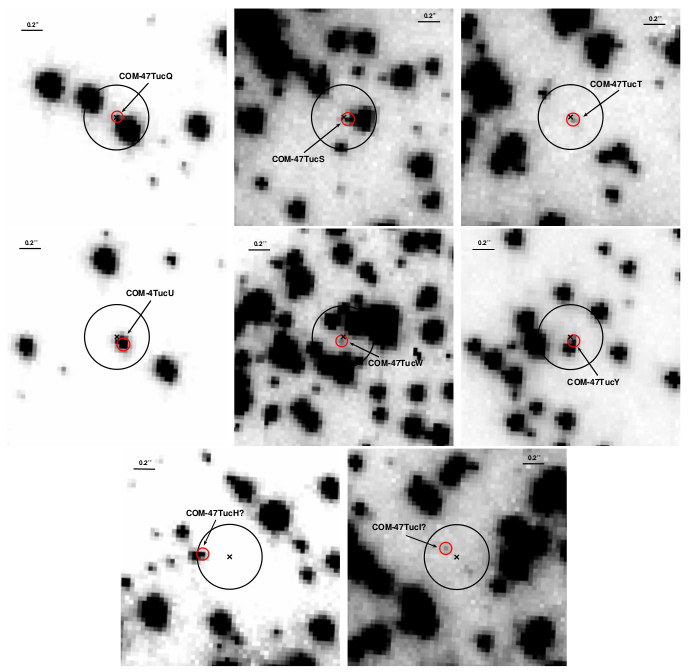 These types of observations are difficult since the crowded stellar environment makes it difficult to accurately identify companion objects and their precise coordinates. From these Hubble images (Fig. 1), the authors find four new WD pulsar companions and conduct follow-up observations on two other known binary systems by looking for any neighboring objects next to the positions of these pulsars. These companion objects are located in a region on the color magnitude diagram (CMD) of the cluster consistent with helium white dwarfs. This ensures that these companions are indeed related to their host pulsars, and not just optical coincidences that lie nearby on the sky. To examine the physical properties of these WD companions, the authors compare the position of each object on the color magnitude diagram with a range of WD cooling curves (Fig. 2). A WD of a given mass moves across the CMD, changing color as it radiates away its remaining heat over time. 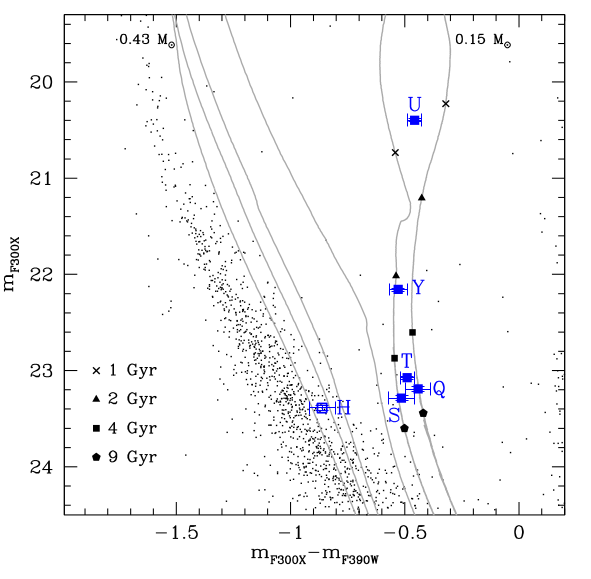 From this analysis, the WD companions all have masses around 0.15-0.2 solar masses, and the derived ages are consistent with what we would expect considering the ages of the pulsars. Fig. 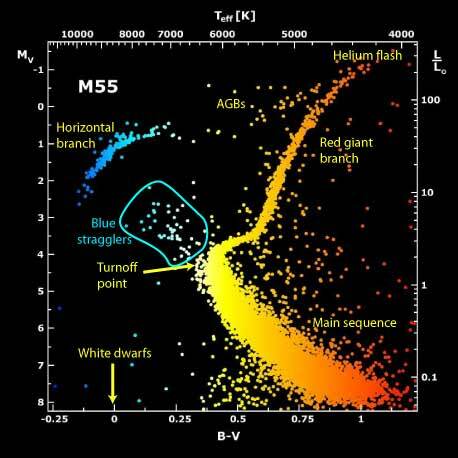 2: Color magnitude diagram of 47 Tuc, zoomed into the white dwarf region. The grey curves indicate He WD cooling tracks for objects of various masses. The blue points indicate the MSP companion WDs observed in this paper, and the black shapes mark the different ages long each of the tracks. Small black dots indicate stars in the clusters. The authors also find one binary system which is believed to contain a redback pulsar. Redback pulsars (named after their spider counterparts known for consuming their mates) are found in systems in which the companion star is being stripped away of its material by the energy radiated away by the pulsar. By looking at the shape of the light curve for this binary system, the authors find evidence that the pulsar’s companion star is indeed being perturbed and heated up by the pulsar’s radiation. By identifying these binary pulsar-WD pairs and measuring their physical properties, we can test the accuracy of our stellar evolution models. Studying these types of systems give us insight into the importance of dynamical interactions between objects undergoing various stages of stellar evolution.